Bake a two layer round cake the size that you need. Ice the cake in white buttercream icing making sure the surface is nice and smooth. Make a yellow icing and use round tip, size #5 and do lace work on the sides of the cake. Write the message on the cake top. Use your white icing and star tip, size #18 and make a shell border around the top and bottom edges of the cake sides. Change to tip #79 and make daisy petals. 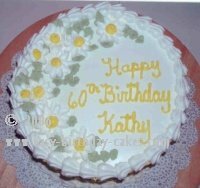 Use round tip, size #5 and yellow icing and make large center dots in the center of each daisy. Make a light green icing and using leaf tip, size #352 make the leaves around the daisies.